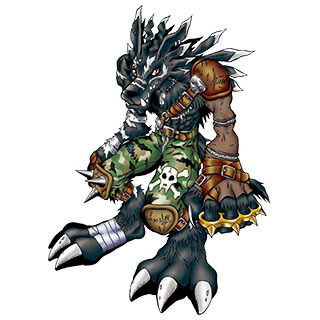 A Digimon that evolved from a Virus attribute Garurumon. Its speed has fallen due to becoming bipedal, but it makes up for that with a powerful, newly-attained technique which utilizes both of its arms. 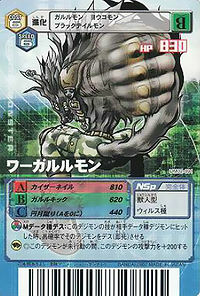 Its Special Move is tearing the opponent apart with the sharp claws on its hands (Kaiser Nail). — Digimon Frontier: "Choo-Choo! 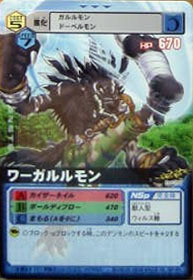 The Great Trailmon Race"
A Digimon that evolved from Garurumon (Black). 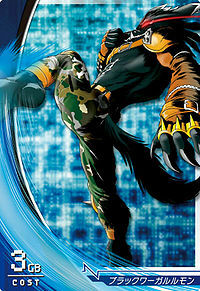 Although became able to walk on two legs, its speed slowed, but gained a fighting technique using both arms in strong attacks. 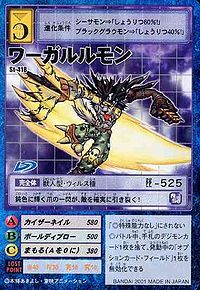 カイザーネイル Kaizā Neiru Wolf Claw/Shadow Claw Slashes at the opponent with its powerful claws. 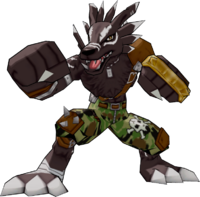 Punches the enemy with its spiked brass knuckles. 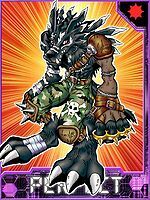 Engetsugeri  Full Moon Kick 円月蹴り N/A Full Moon Kick/Half Moon Kick A powerful kick that can fire a blade of energy at the opponent.. Fires high temperature blue flames from its mouth. 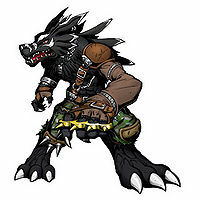 Were Garurumon, along with a Dogmon, enter a Trailmon race. They pilot Trailmon Buffalo. He cheats throughout the event, knocking out all but Takuya piloting Trailmon Worm from the race. Near the end of the race Takuya spirit evolves into Vritramon and combines his power with Trailmon Worm to create a flame that forced Trailmon Buffalo off the track, causing him to lose. Dogmon seemed to think this was funny and snickered so he knocked him out. Were Garurumon and Dogmon later popped up at the Akiba Market amongst the Digimon being evacuated. 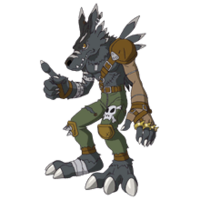 Can be evolved from Gryzmon if above level 20, or can be found at Bug Bug Jungle. 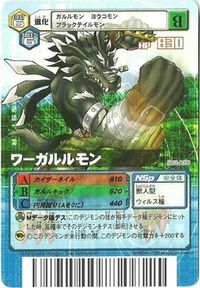 Can be evolved from Orgemon. Can evolve into Gulfmon. 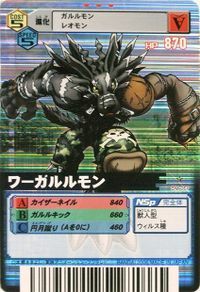 This Virus attributed Were Garurumon has powerful legs. 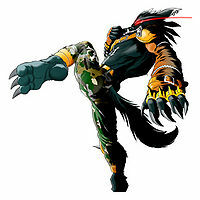 The flash of its shining, grey claws is certain to tear up the enemy! 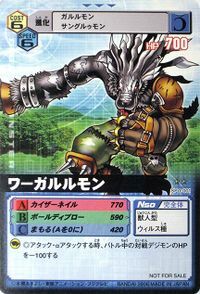 Having evolved from a Virus type Garurumon, it dropped its speed in favor of strengthening the attack power of its arms, gaining new techniques in the process. It puts pressure on the opponent with its razor-sharp bloodthirst. 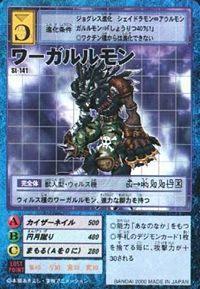 ↑ Digimon Frontier: "Trailmon vs. Trailmon"
This page was last modified on 28 March 2019, at 09:36.